After MailStore Server comes the launch of Status Reports in the Service Provider Edition (SPE). With this new feature, user-side administrators have the option of regularly informing themselves about all the relevant data within an instance. The Status Report is a much sought-after feature with our customers. With the release of MailStore 10.2, the SPE is now also benefiting from the inclusion of Status Reports. The feature is enjoying great popularity, and not without reason – it saves time, it is clear, and it can be customized. Administrators of an instance have the option of generating Status Reports autonomously. The Status Report contains a list of the archiving profiles and jobs executed. It is apparent at a glance whether their execution was successful or not. With such a clear summary, MailStore – and with it the service provider – can actively alert the administrators of an instance to potential problems, enabling them to respond in a timely manner. 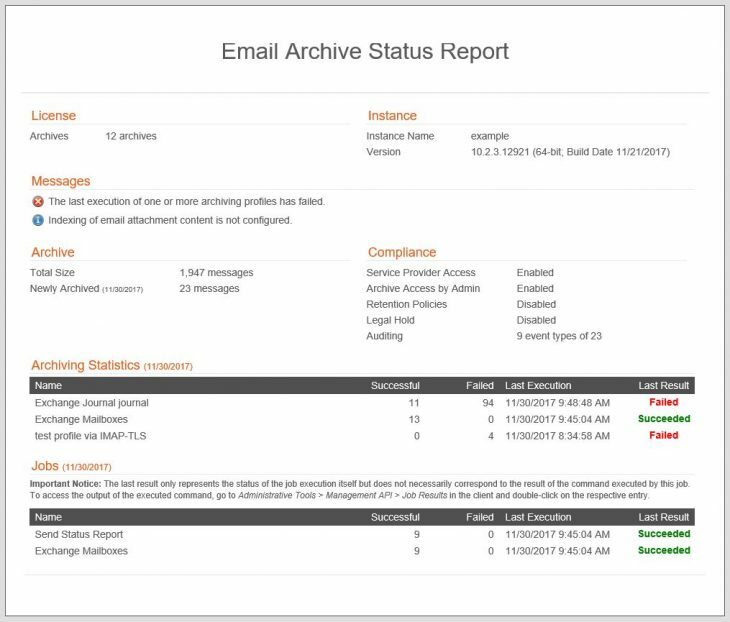 Everything at a glance in an email – with Status Reports in the MailStore SPE. Status Reports are sent via email at individually selectable intervals, on the basis of a job to be set up by the administrator. The only prerequisite for sending a report is a functioning configuration of the STMP settings. Hence the status of the archiving profiles and jobs can be viewed as part of a routine email check, without having to separately launch the email archive client. You can decide for yourself how often you want to be informed using a Status Report. The specified period that you want to receive information about in the Status Report is also individually selectable. You can request a report for the previous day or even the past month. In addition, the Status Report provides an overview of all the archived emails. You can request an overview of recently archived emails or all the emails already in the archive. The Status Report is an enhancing feature for the instance administrator. Service providers should be aware that this does not replace comprehensive monitoring of your MailStore SPE environment. In the SPE Help section’s Monitoring article, service providers can find out exactly which parameters of an SPE environment should be monitored with a monitoring solution to ensure smooth operation. Try our new feature today with no obligation and free of charge, and register as a service provider. You will have access to free trial versions, white papers, pricing information, and much more. We hope our new feature will be a useful addition for you. If you want to find out more about MailStore SPE, please contact us and we will be happy to advise you.